This log store is 6' Long and 6' High, made using Cedar wood. 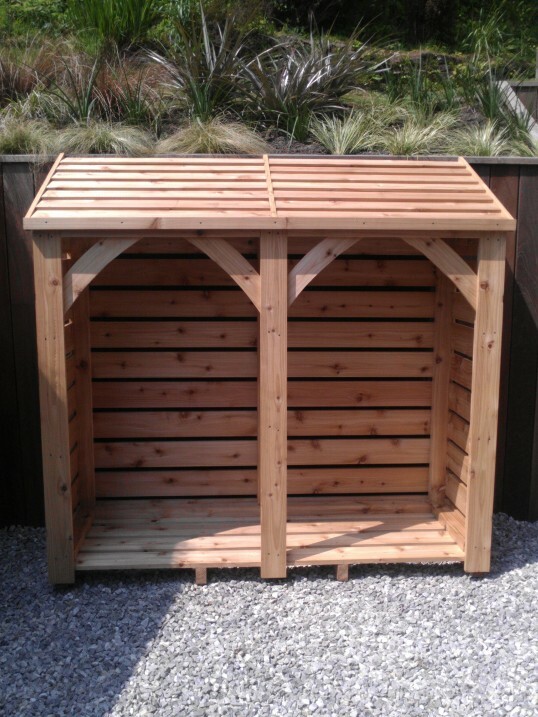 £635 includes full construction and treating of the Log Store. 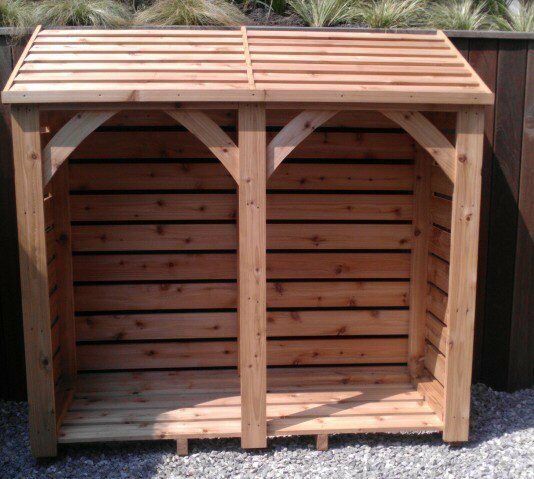 Standard UK delivery is included with this log store. A shelf all the way across can be added for £60. This log store will take up to 60cm (24") depth of logs and kindle, approximately 3 rows of 8in logs or 2 of 10"-12". It stores about 1.5 cubic meter of logs. While we treat with an oil based preservative as standard, it can be left untreated if you prefer, for example if you intend to paint it (images shows untreated). It can be treated either Light golden brown colour (as shown in the second image at the bottom of this page), dark brown, cedar which is a red brown colour, ebony, or a clear treatment. We prefer to deliver ourselves if we can, and can give a choice of day and time, including evening and weekends, but please check with Sadie first if we can deliver to you; if you are within about a couple of hours from us we definitely will. Occasionally we will deliver a little further away, especially if you need an evening or weekend timed delivery or you need help putting the log store in place. Unless we make arrangements with you someone will need to be at your property to accept and check a Pallet delivery, and you will need two people at your end to move the Log Store to where it will be sited. The pallet company only deliver to the property, they do not help you put it into place. Choose the day you want delivery, then the pallet company deliver between 9am and 6pm that day. You can upgrade to a timed delivery (timed between 10am to 2pm delivery slot) Monday to Friday, costing £18, or a Saturday morning delivery is £35. There is a charge for delivery to all British Islands and for Postcodes AB10-56, DD, DG, EH, FK, G, KA1-26, KA29+, KY, LD, LL32-37, ML, PA1-19, PH, SY3+, TD, TR, IV1-11. If you let me have your postcode I will get a quote for you from the courier.